Last weekend I did Cruise to the Coast ride with CAM. We cycled through Bhagamandala – Bekalfort – Kasargod – Jalsoor and covered ~130 kms. We started from Bangalore on Friday (4th Oct) night and reached Bhagamandala at 5 AM on Saturday. 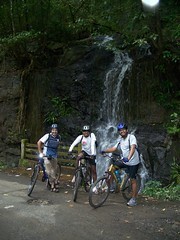 Then after couple of hours of rest we started cycling to Bekal Fort. We followed http://goo.gl/maps/dDFtN route. On the way we saw many waterfalls. Both sides of the roads there were just trees. I maintained distance from other cyclist most of the time. It was like I was alone on the road. All the nature beauty was just for me. While cycling I can see yellow butterflies on the roads, like they were welcoming us. I used to see and play with them in my childhood. I almost forgot that there are such butterflies. 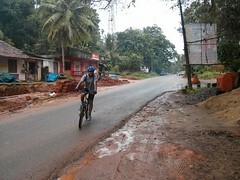 Most of cycling we did in Kerla state and I must mention that the people/govt. has tried to keep it green and clean. Some houses on the way were very beautiful. They had very good wood work. Some houses even had their own water well. I know this sound stupid to mention but I have seen them since ages. On they way be Bekal Fort it started raining. I cycled around ~20 kms during that. It was such a great feeling. I even tasted the rain water which got mixed with my sweat. It was sweet ..:). I reached at Bekal Fort ~3 PM. After spending some time there we headed to our hotels. Second day we started at 7 AM cycled from Kasargot to Jalsoor, which was around 50 kms. We followed http://gooaps/oOx8c route. We reached to Jalsoor around 11:30 AM and started our journey back at ~12:30 PM. We reached Bangalore ~10:30 PM. During the ride people greeted us, kids have us high five. Kids kept asking “Whats your name” and “Where are you going”. Overall it was fun ride. I made some new friends and hope to keep in touch with them.